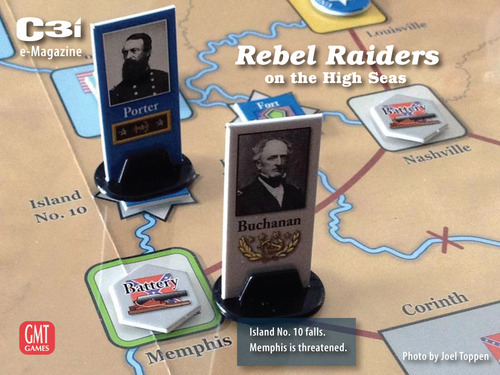 Rebel Raiders on the High Seas is a comparatively short and simple game of the naval conflict at sea and on the great rivers in the American Civil War. Easily playable in less than three hours, Rebel Raiders on the High Seas is a strategic contest between two players, one seeking to reunite the Union by force, the other to maintain its new independence in the face of the escalating industrial might and resolve of its northern brother. 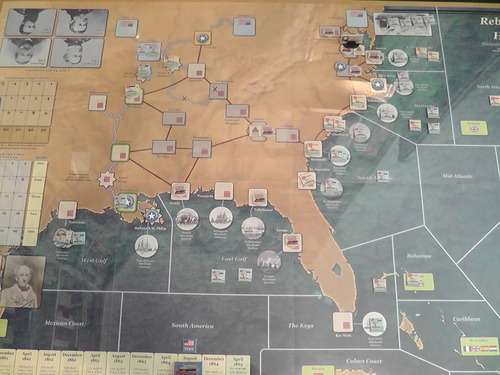 More of a representation than a detailed simulation of that conflict, the game is intensely engaging, highly interactive and moves along quickly, with players constantly responding and reacting to their opponent’s moves. The Confederate Player sends Blockade Runners and Raiders abroad to gather supplies and inflict economic losses on the Union (as represented by Victory Points), while at the same time building batteries, gunboats and ironclads to defend ports and cities. 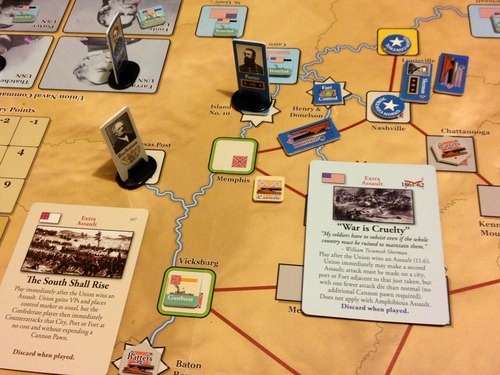 The Union player seeks to create, extend and reinforce a naval blockade on the Confederacy and to conquer its cities, forts and ports by a combination of naval, amphibious assault and land combat. What these efforts underlay is the game’s ultimate question: can the South, with limited means, hold off the industrial might of the North as represented by its ever growing resources long enough to secure independence? Both players face the challenge of conflicting demands on their resources to accomplish strategic objectives; there is the cat and mouse game within a game of blockaders vs blockade runners and Rebel Raiders vs Union Steam Frigates seeking to run them down and drive them from the seas. Whether to emphasize the blockade, Commerce Raiding (or counter-Raider operations) versus competing priorities of the land and riverine campaigns provides players an intriguing and often vexing conundrum: particularly when the vagaries of combat upset best laid plans. As play proceeds, a fast and furious struggle ensues on the high seas as the Kearsarge, Brooklyn, Hartford and other Union sloops chase and hunt down Confederate raiders like the Shenandoah and Alabama. Rebel blockade runners try to shoot past the ever tightening Union net off Southern ports and in coastal waters, racing to destinations as far away as Mexico, Brazil, Africa and Europe to gather the supplies the Confederacy desperately needs to maintain its war effort. Gunboats and ironclads such as the Tennessee, Arkansas, Monitor and Carondelet, just to name a few, fight it out up and down the Mississippi and into the great ports of New Orleans, Mobile, Charleston, Savannah and Norfolk. While naval forces led by Farragut, Porter, Buchanan and Semmes duel each other on the high seas and rivers; Grant, Sherman, Lee and Johnston pit their vast armies against each other in a simple yet exciting back and forth struggle to save or crush the Confederacy. 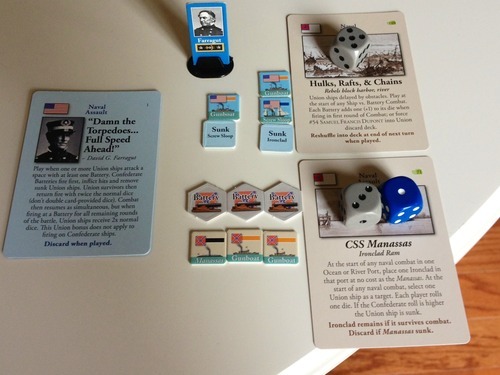 Although the majority of ship playing pieces represent generic vessels of a broad type, a deck of cards and special counters allows for many of the unique ships, personalities and events of the war to be represented, as well as rules to give players tactical battle decisions such as whether the Confederates should sortie with warships to protect their land batteries or for the Union whether to use ironclads to screen their more vulnerable wooden vessels. This gives a strategic game an occasionally intensely tactical focus providing players a “best of both worlds” gaming experience. 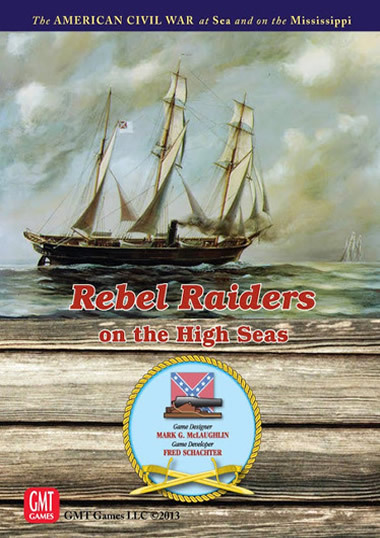 Although Rebel Raiders on the High Seas is not a card-driven game, the cards ensure that each game is very different, and that a strategy which worked in one game may not prove as efficacious in the next. The game is also customizable with a menu of elective rules to provide each side with a variety of “what if” options to further vary play.